Authors: J. Bobin, F. Sureau, J. -L. Starck et al. 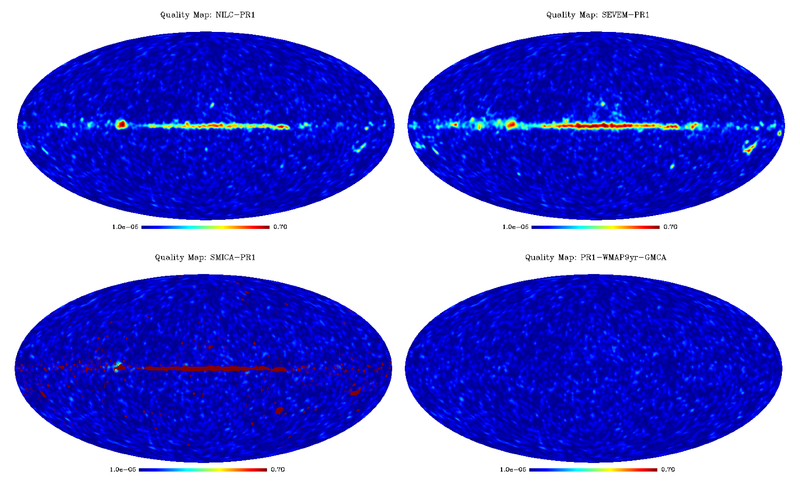 We present a novel estimate of the cosmological microwave background (CMB) map by combining the two latest full-sky microwave surveys: WMAP nine-year and Planck PR1. The joint processing benefits from a recently introduced component separation method coined "local-generalized morphological component analysis'' (LGMCA) based on the sparse distribution of the foregrounds in the wavelet domain. The proposed estimation procedure takes advantage of the IRIS 100 micron as an extra observation on the galactic center for enhanced dust removal. 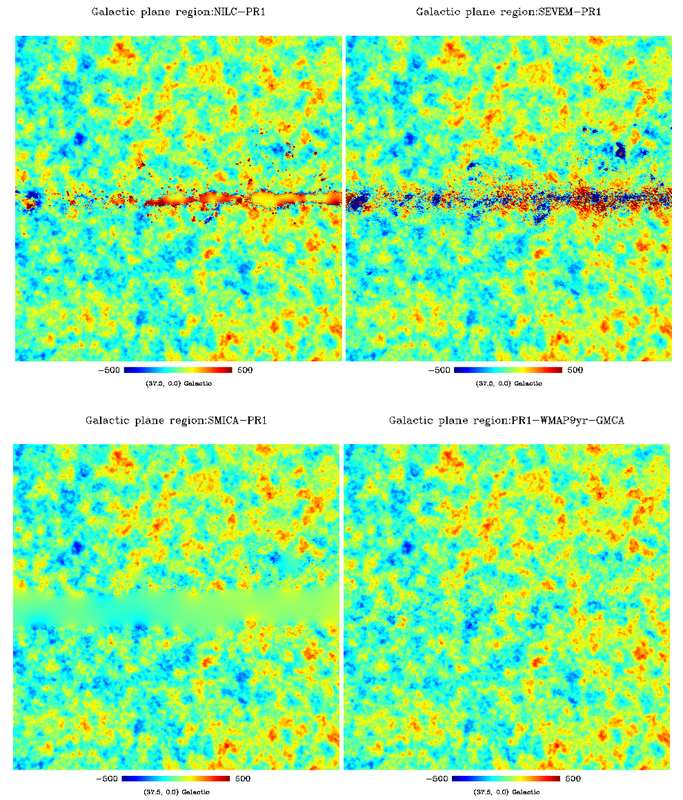 We show that this new CMB map presents several interesting aspects: i) it is a full sky map without using any inpainting or interpolating method, ii) foreground contamination is very low, iii) the Galactic center is very clean, with especially low dust contamination as measured by the cross-correlation between the estimated CMB map and the IRIS 100 micron map, and iv) it is free of thermal SZ contamination. It is usually hard to derive a discriminative criterion from real data. For that purpose, the quality map measures an excess of power in the estimated CMB map in the wavelet domain with the respect to the expected power of the CMB. 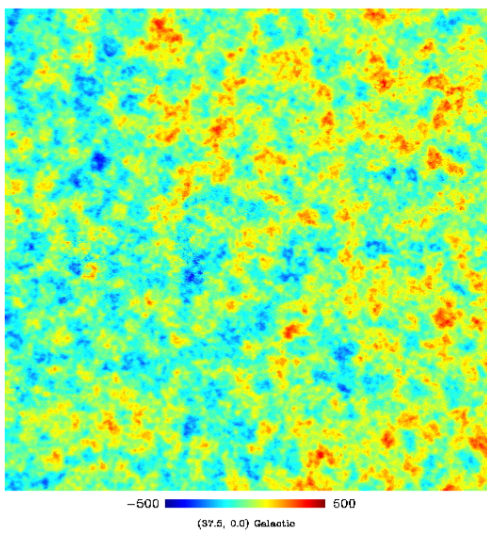 The expected CMB power is computed from the Planck best-fit power spectrum assuming a fiducial cosmology. 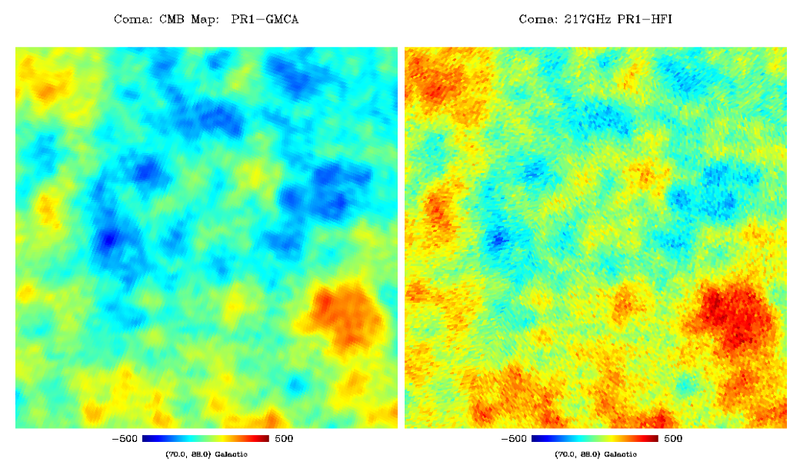 The maps below shows the differences between HFI-217GHz and CMB maps, respectively PR1 NILC, SEVEM, SMICA and WPR1 LGMCA. 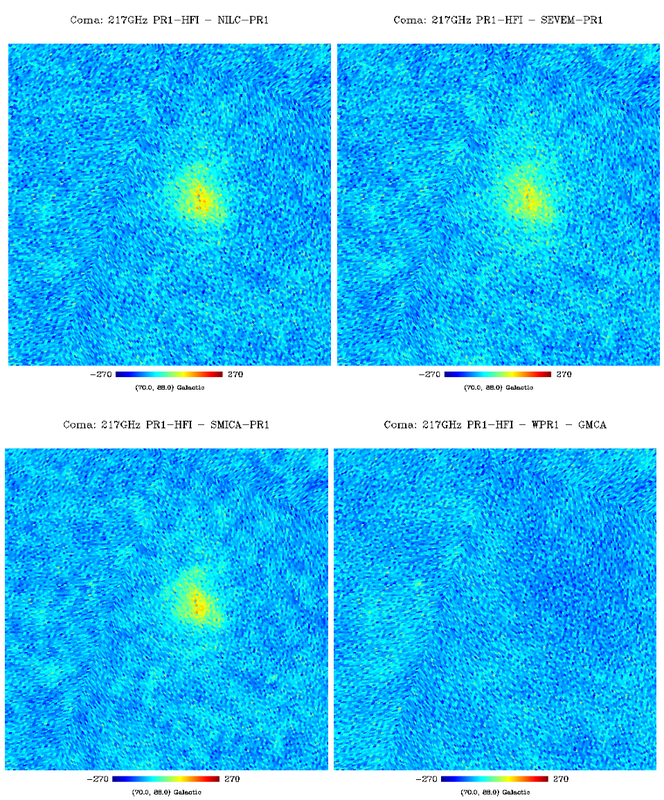 As the SZ vanishes at 217GHz, the presence of residuals of tSZ in the difference reveals a tSZ contamination in the estimated CMB map. Below we show the power spectra. Left, estimated power spectrum of the WPR1 LGMCA map (red) and official PR1 power spectrum (green). The solid black line is the Planck-only best-fit Cl provided by the Planck consortium. Right, power spectrum in logarithmic scale. Error bars are set to 1 sigma. And finally, the difference spectra. Left, difference between the power spectrum estimated from the WPR1 LGMCA map (red) (resp. official PR1 power spectrum (green)) and the Planck-only best-fit provided by the Planck consortium. Right, difference between the estimated and theoretical power spectra in logarithmic scale. Error bars are set to 1 sigma. 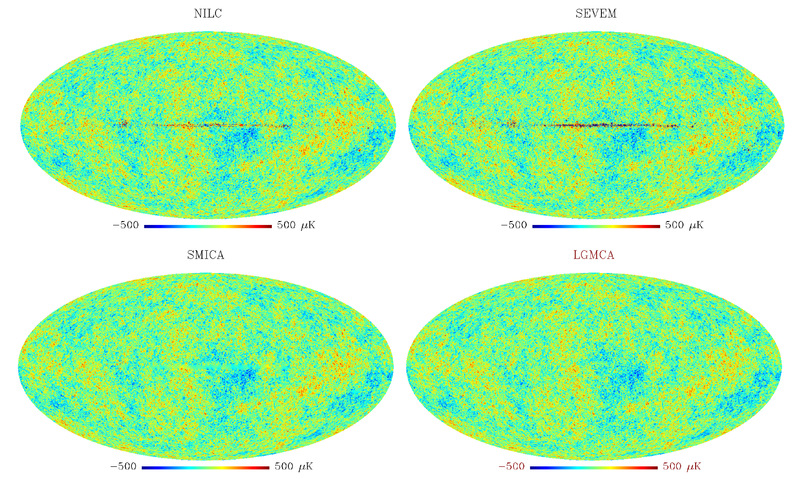 This clean and truly full-sky estimate of the CMB map is a very good candidate for galactic studies. Being free of noticeable remainings of thermal SZ, it will be helpful for kinetic SZ studies. As well, following the philosophy of reproducible research, the LCS makes available all the codes used to estimate and evaluate the CMB map.